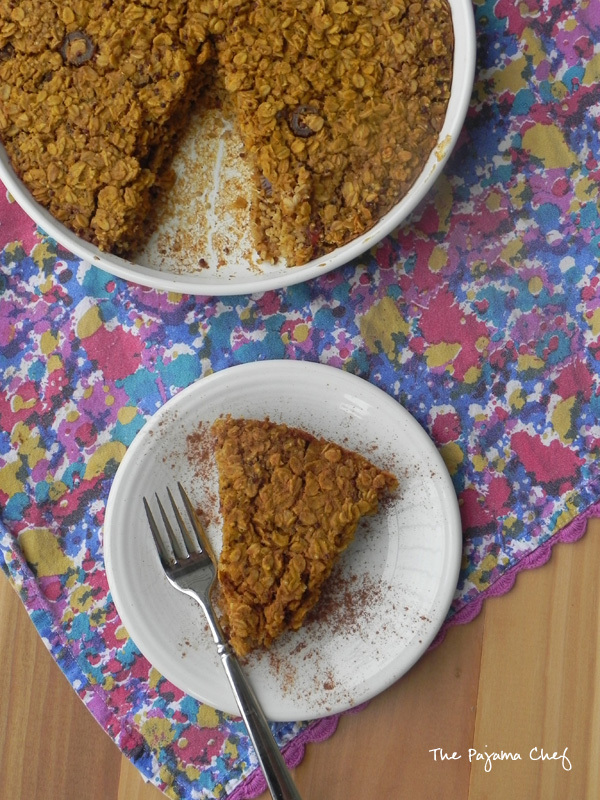 Pumpkin oatmeal meets quinoa in this hearty, healthy baked breakfast dish! For awhile now, I’ve seen recipes using quinoa, barley, or farro as a pseudo-oatmeal. I’ve gotta admit though–while those recipes SOUND good, they also seem a little scary. Old breakfast habits die hard, I suppose. To ease my way into this breakfast madness, I decided to combine quinoa with oatmeal in a baked breakfast dish. 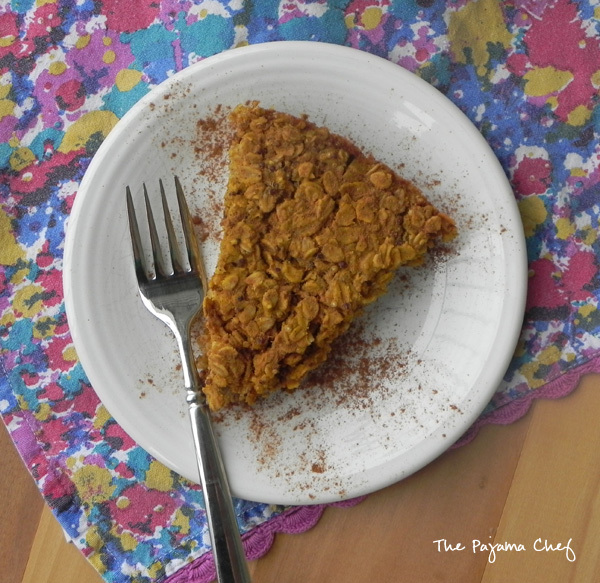 I added tons of pumpkin pie spice and pumpkin puree to make this dish seasonally appropriate. It was such a hardship, let me tell you. Ha. Not at all! I should have known to always trust quinoa. And pumpkin. 🙂 This breakfast was so great! I enjoyed it a few ways–warm with cinnamon as pictured above, warm in a bowl with some Greek yogurt and maple syrup, and warm in a bowl with almond milk and some maple syrup and dried fruit. The bake is also hearty enough to just be cut and served at room temperature. I think it could be excellent with some peanut butter or even pumpkin butter spread on top. Mmmm! I’ll have to make it again soon. I always get good serving ideas after everything’s all gone. 🙂 Enjoy! In a small saucepan, cook 1/2 cup quinoa in 1 cup water according to package directions. Set aside to cool. Preheat oven to 350 degrees and grease a 10 inch round casserole dish [a pie plate or square baking dish will work too, but cooking time may vary]. Meanwhile, whisk together oil, pumpkin, maple syrup, and egg. Fold in oats, baking powder, pumpkin pie spice. When quinoa has cooled down, add quinoa, vanilla, and milk, stirring to combine. Spoon batter into prepared pan and smooth out if necessary. Bake for 30-35 minutes or until firm and golden brown. Serve warm with almond milk or Greek yogurt, plus additional sweetener/dried fruits/nuts if desired. I love that it’s kind of like eating pie for breakfast… But a totally healthy pie! what a great way to think about it! 🙂 thanks! Such a yummy way to start the day! I have no issues combining oatmeal and quinoa…sounds fabulous! You had me at oatmeal. I love the stuff. What a gorgeous and delicious recipe! Thank you Sarah – delicious. 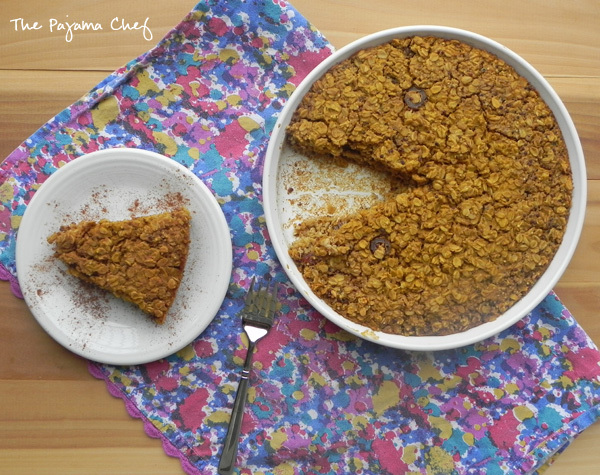 I would love to start my mornings with this oatmeal bake! Holy deliciousness, Sarah! I love this. Thanks for sharing it with #PumpkinWeek. thank you for hosting, camilla! Love the idea of combining the oatmeal with quinoa! Pumpkin weeks sounds totally fun! What a delicious creation! 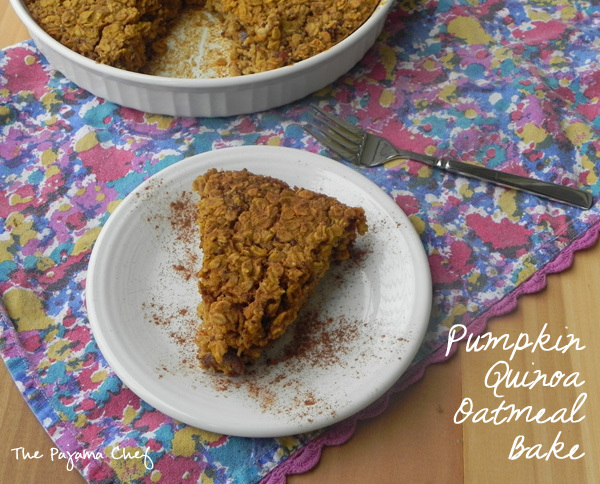 Love the combination of pumpkin, quinoa and oatmeal. Yum! thanks, julia! it was great! This sounds like a deliciously healthy way to start the day! yep yep! exactly what i go for 🙂 thank you, marion! Definitely looks like a healthy and delicious breakfast! Thanks for sharing.